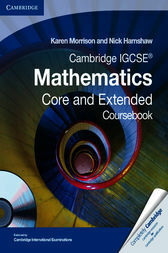 Endorsed by Cambridge International Examinations, this new series offers all the resources you will need to completely cover the Cambridge IGCSE Mathematics (0580) syllabus. A Coursebook, two Practice Books and a Teacher's Resource provide thorough explanation and ample practice opportunity to help students to understand their IGCSE maths course and support teachers in guiding them. Suitable for all classrooms, whether core and extended students are learning together or separately, these resources will help students to achieve their potential in maths.